Yesterday the President of the United States invited three highly-decorated military veterans - elderly "Navajo code talkers" - to join him up on the White House podium. In front of a heroic portrait of Andrew Jackson, the draft-dodging US President was condescending. He tried to cleverly brandish the word "Chief" before he mocked & denigrated a political enemy (absent), doubting her family ancestry. Of course, while a wealthy businessman for many years he did similarly to Pres. Obama in regard to birthplace and citizenship. Those enabling Trump are horribly obscene. They know they're doing wrong. 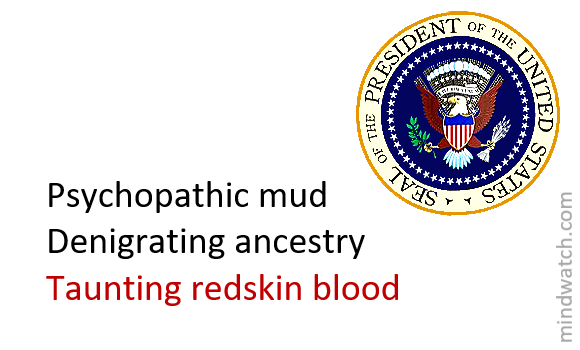 Trump links the Navajo & Pocahontas. ; very different peoples & cultures who both suffered. Physically separated 2100 miles (3400km; Dinétah or Farmington NM, to Jamestown VA), more than Beijing - Kathmandu, or Paris - Jerusalem.